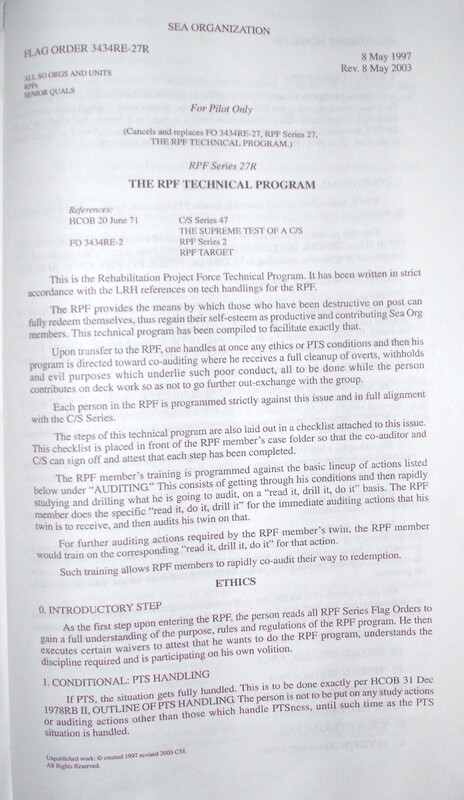 As there are circumstances where some RPF members need access to Advanced Course materials in order to get through their RPF technical program, security regulations regarding the use of these materials must be known and followed by those administering the RPF and by the RPF itself. 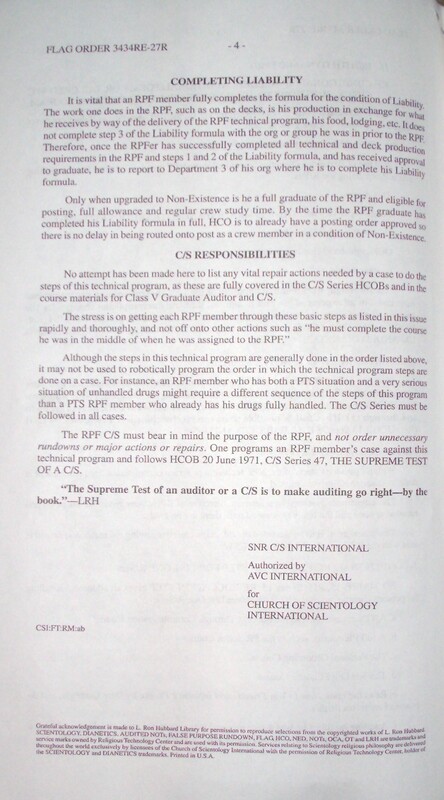 Access to upper-level materials is subject to a special license from RTC to the corporation which houses the CLO or the organization which the RPF is under (eg, FLO, FLB). As the security of these materials is absolutely essential, they are to be used only under secure, tightly supervised conditions. 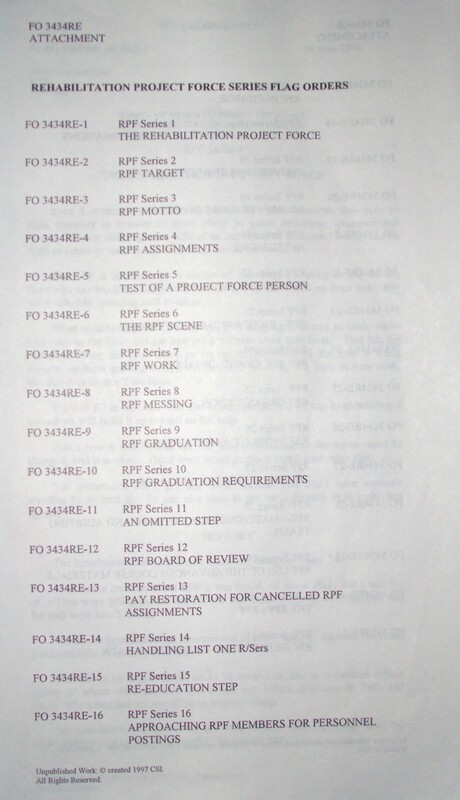 All upper-level materials used by the RPF must be kept in a highly secure space and employ the same high-tech security systems as an Advanced Organization. 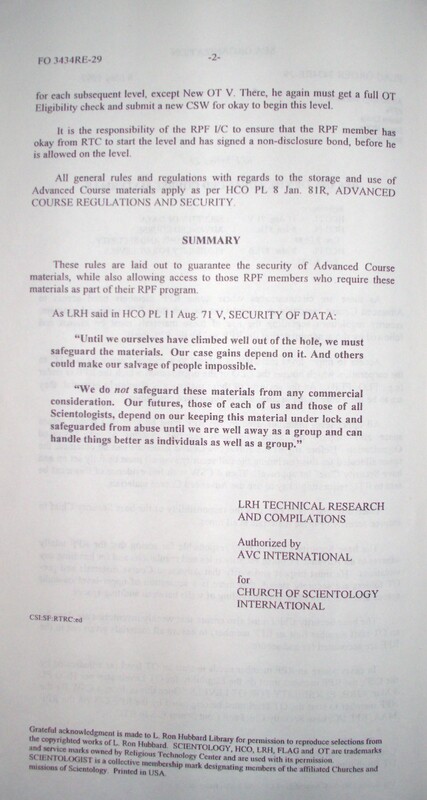 Before any of the Advanced Course materials can be obtained, the space allocated for this (including the full security system) must be fully set up and have Security Chief lnt approval. Then a CSW with full evidence of this must be sent to RTC requesting okay to use the Advanced Course materials. Once this space is in use, it is the responsibility of the base Security Chief to enforce security of these materials at all times. 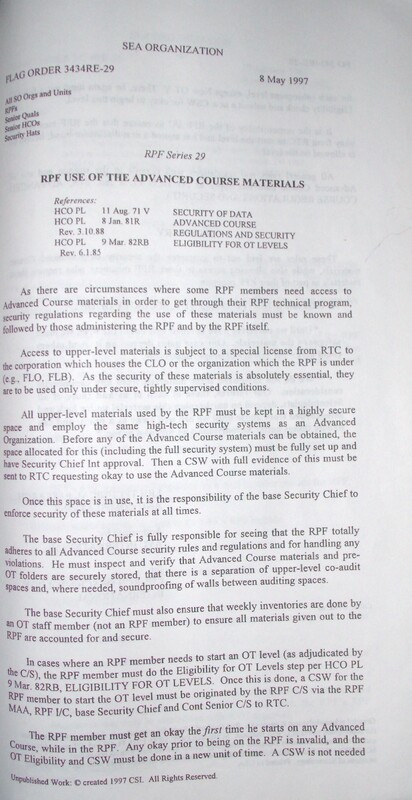 The base Security Chief is fully responsible for seeing that the RPF totally adheres to all Advanced Course security rules and regulations and for handling any violations. 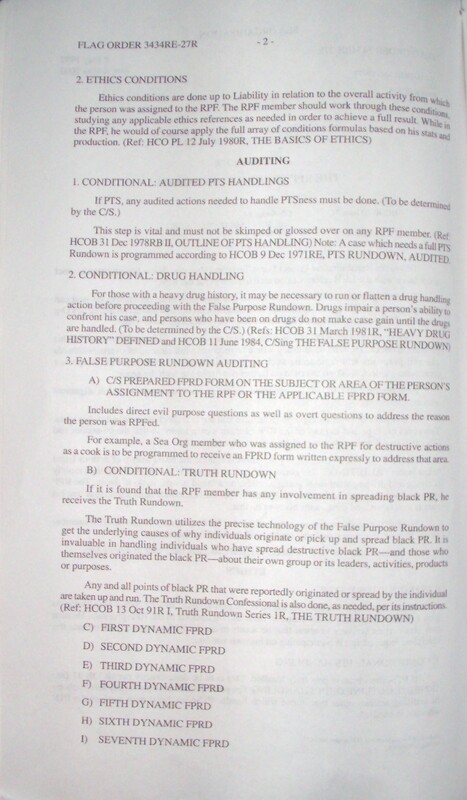 He must inspect and verify that Advanced Course materials and pre-OT folders are securely stored, that there is a separation of upper-level co-audit spaces and, where needed, soundproofing of walls between auditing spaces. 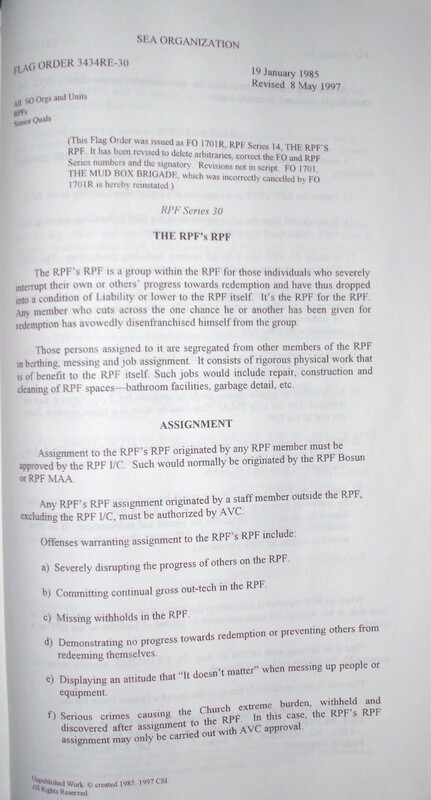 The base Security Chief must also ensure that weekly inventories are done by an OT staff member (not an RPF member) to ensure all materials given out to the KPF are accounted for and secure. 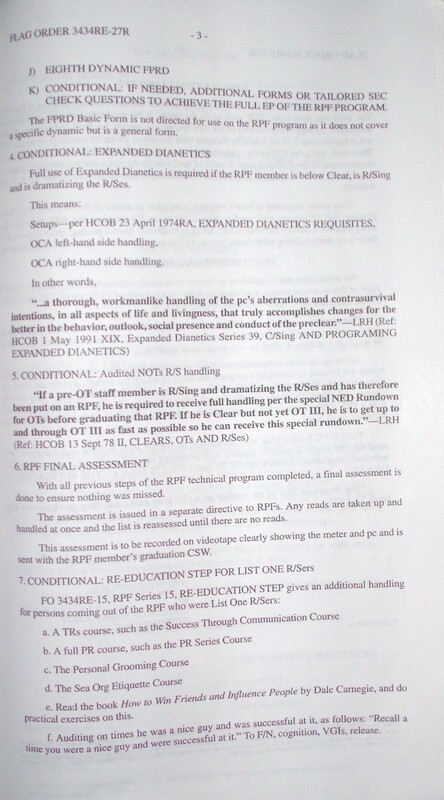 In cases where an RPF member needs to start an OT level (as adjudicated by the C/S), the RPF member must do the Eligibility for OT Levels step per HCO PL 9 Mar. 82RB ELIGIBILITY FOR OT LEVELS. Once this is done, a CSW for the RPF member to start the OT level must be originated by the RPF C/S via the RPF MAA, RPF I/C, base Security Chief and Cont Senior C/S to RTC. 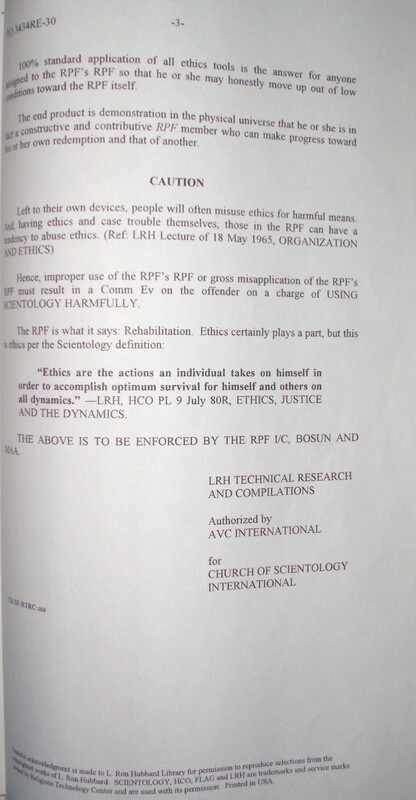 Unpublished Work: © created 1997 CSI. for each subsequent level, except New OT V. There, he again must get a full OT Eligibility check and submit a new CSW for okay to begin this level. It is the responsibility of the RPF I/C to ensure that the RPF member has okay from RTC to start the level and has signed a non-disclosure bond, before he is allowed on the level. All general rules and regulations with regards to the storage and use of Advanced Course materials apply as per HCO PL 8 Jan. 81R, ADVANCED COURSE REGULATIONS AND SECURITY. 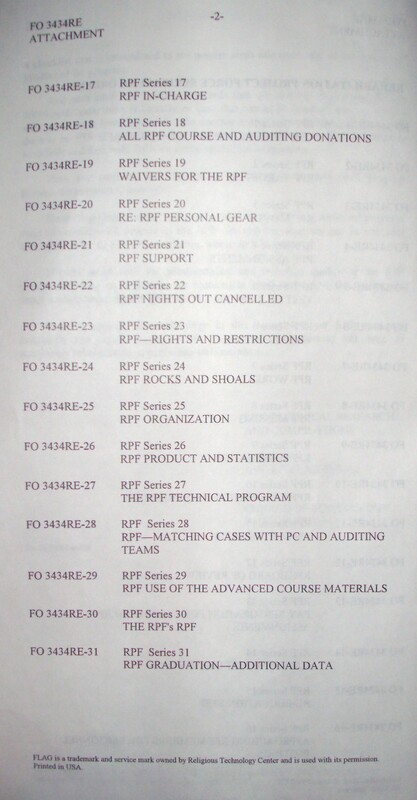 These rules are laid out to guarantee the security of Advanced Course materials, while also allowing access to those RPF members who require these materials as part of their RPF program. 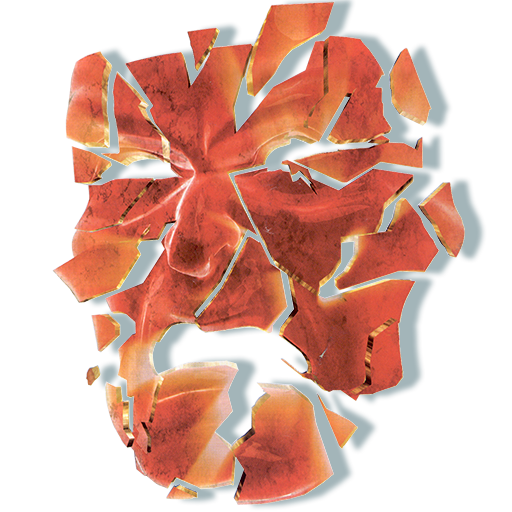 “Until we ourselves have climbed well out of the hole, we must safeguard the materials. Our case gains depend on it. And others could make our salvage of people impossible. 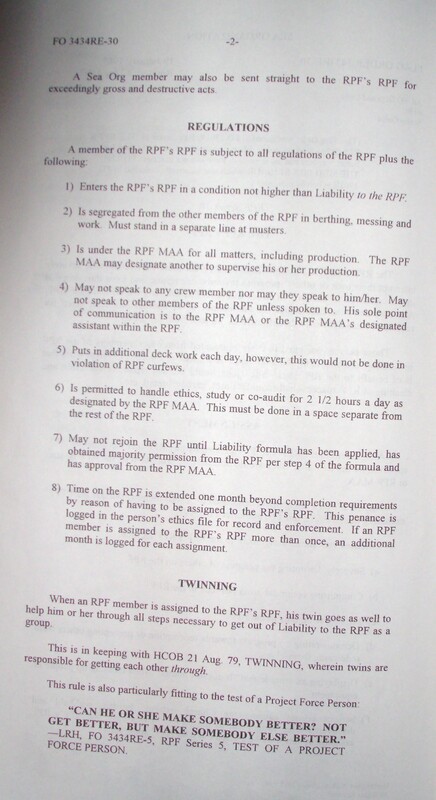 The org to which the RPF member will return bears the cost of crew welfare (by which is meant pay, berthing, food and medical) and any other such expenses for that RPF member. 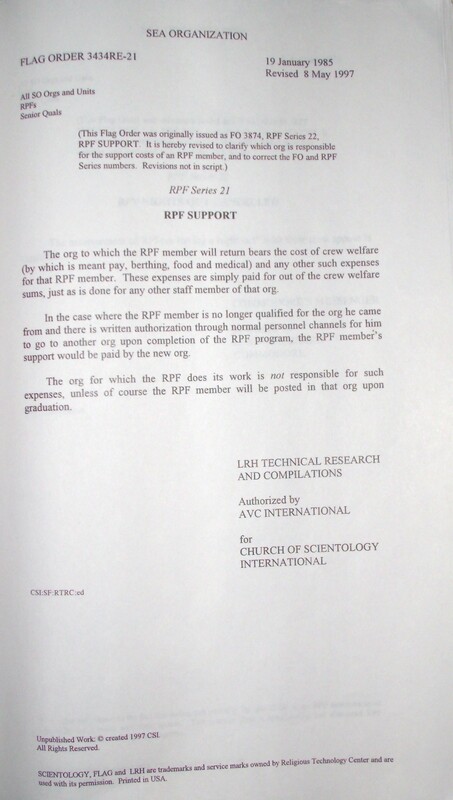 These expenses are simply paid for out of the crew welfare sums, just as is done for any other staff member of that org. 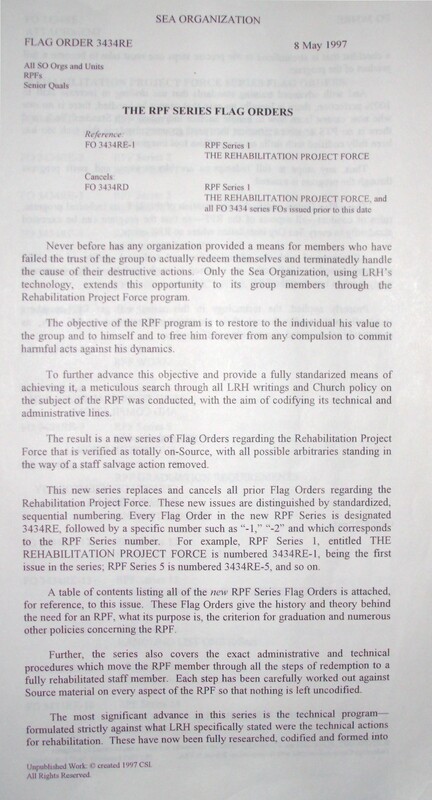 In the case where the RPF member is no longer qualified for the org he came from and there is written authorization through normal personnel channels for him to go to another org upon completion of the RPF program, the RPF member’s support would be paid by the new org. The org for which the RPF does its work is not responsible for such expenses, unless of course the RPF member will be posted in that org upon graduation. 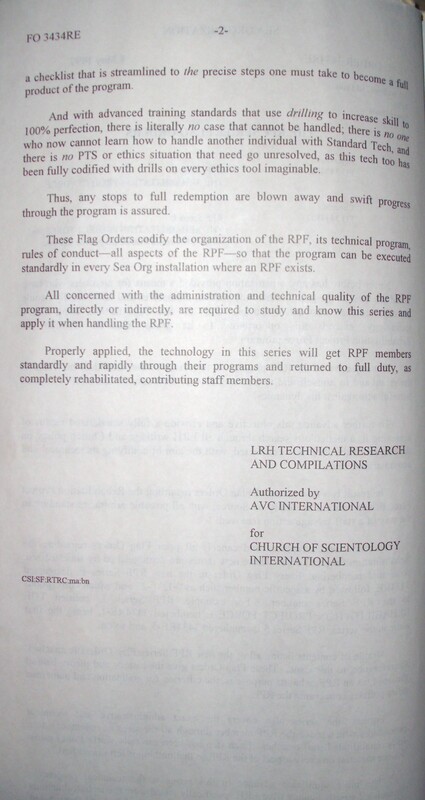 SCIENTOLOGY, FLAG and LRH are trademarks and service marks owned by Religious Technology Center and are used with its permission. Printed in USA.